This survey is part of a research project developed by Dr. Luisa Bravo, during her appointment as postdoctoral research associate at the Department of Architecture, University of Bologna, Italy (2009-2014). The research project is about public spaces and urban daily life in the contemporary dimension of the city, both for consolidated and suburban areas. Starting from case studies in Europe and particularly in Italy, Dr. Bravo developed her work regarding suburban areas as Visiting Scholar at the Institute of Urban and Regional Development (IURD), University of California Berkeley. A special issue (#1/2013) of the e-journal "IN_BO. Ricerche e progetti per il territorio, la città e l'architettura", published at the Department of Architecture, University of Bologna, collects research and teaching activities of different scholars involved in our "Past present and future of public space" international project. The special issue of "IN_BO" was presented and discussed at the Biennale dello spazio pubblico, during an international session, at the Faculty of Architecture Roma TRE, on May 18, 2013. The e-journal is bilingual (Italian/English), the default language of the platform is Italian. To read it in English switch the language on the top right menu, using preferably Mozilla Firefox. New York City experienced a major transformation during Michael R. Bloomberg’s three terms as mayor: public spaces and infrastructures, new housing complexes, with a large growth, more than any other city, and an increase in liveability and walkability, transforming bicycling from a recreational activity into a real alternative to cars. The New York Times explores Bloomberg urban actions, through digital interactive maps, comparing pictures from different periods. Enjoy this amazing tour inside the city! Our Past present and future of public space project will be hosted in an international session at the Biennale dello spazio pubblico in Rome (BiSP2013). Different scholars from all over the world will meet and discuss on Saturday May 18, 2013, starting from 11.30 am. Look at the program of the session! Come and join us, you are welcome! Look at the map for the conference place. For miles and miles, you can walk through the city of Hong Kong without ever once putting a foot on the ground. All day you can get everywhere you need to go, taking care of any errand you might have on your list, all while separated from the streets and surface of the city. This is possible thanks to the network of elevated walkways and underground tunnels that have gradually developed in the city – both formally and informally – over the past 50 years. It's an impressively widespread pedestrian infrastructure, linking people to the waterfront city's wide array of transportation options. And as a forthcoming book contends, it's also a new kind of civic space and even a new form of citymaking. 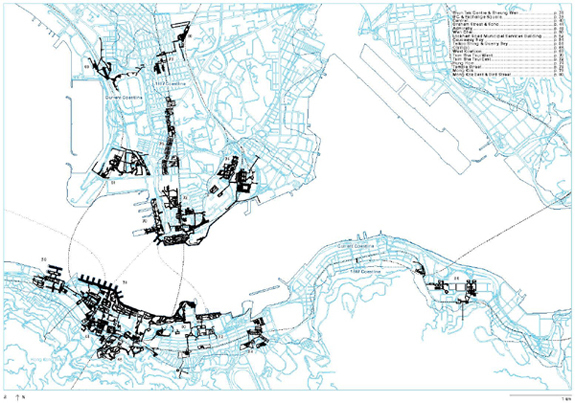 Cities Without Ground: A Hong Kong Guidebook, available since September 2012 from ORO Editions, considers the city through the lens of these above- and below-ground walkways, creating the first-ever maps showing the extent and variety of these networks.